So, it's true after all. The Michael Fassbender AC movie is real! Just kidding.. of course I know it was real for a long time already.. It's just that with so many rumours, changes and cancellations over the past year or more, I really didn't know what to believe anymore. It was more of a "I'll believe it when I see it". But here it is.. Our first official image from the movie of none other than Michael Fassbender in the Assassin outfit. 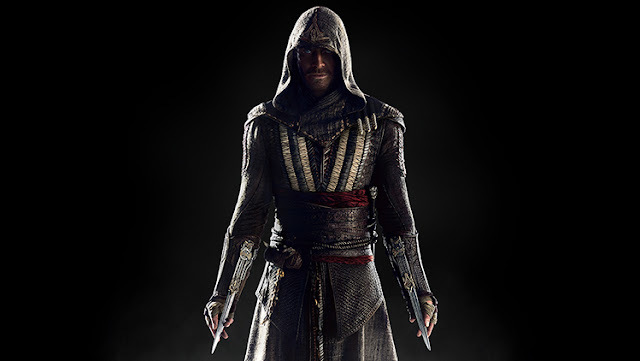 "While the movie’s story isn’t based on any specific Assassin’s Creed game, the movie’s costume design team has made every effort to stay true to the historically-slanted visual style of the series. “I have much respect for the historical accuracy and vast characterization represented in each game,” says Sammy Sheldon Differ, costume designer on “Assassin’s Creed”. “This has been a fantastic starting point to understand what is needed to be faithful to the artistic content and begin creating our film world. Bearing in mind this rich base, I have used our period of 15h century Spain, with its strong influences of Moorish deco, to give the Assassin’s looks a nomadic warrior personification." and the first details of the movie..
Michael Fassbender takes on the role of Callum Lynch who discovers that he is a descendant of the secret Assassins society through unlocked genetic memories that allow him to relive the adventures of his ancestor, Aguilar, in 15th Century Spain. After gaining incredible knowledge and skills he’s poised to take on the oppressive Knights Templar in the present day. Callum Lynch is a character created specifically for the movie and the movie itself isn't based on any of the games. Instead, it is an addition of new characters into the same world. I like what I'm seeing and hearing at the moment. With a good cast of actors, this has the potential to be a great movie. Let's hope for the best!